It was an especially fragrant bouquet of roses on my dining table this week that got me thinking about what an incredible thing our sense of smell is. it’s the only sense that has a direct connection to our brains. We can detect at least a trillion distinct scents. Our scent cells are renewed every 30 to 60 days. Some of the most pleasurable scents, according to recent research, include vanilla, some orange scents, cinnamon, crayons and cookies. I don’t have any crayon or cookie scented flowers but wouldn’t that be a great addition in the garden? Where does fragrance come from? Fragrance in flowers is nature’s ways of encouraging pollination. Just as it draws you to take a deeper whiff, it lures insects to blossoms hidden by leaves and other plants. Some flowers are fragrant only at night and attract only night-flying pollinators like moths, while others are more fragrant only during the day and attract insects like bees and butterflies. The fragrance itself comes from essential oils called attars that vaporize easily and infuse the air with their scents. They are present in different combinations in different plants, but often they are markedly similar which is why there are irises that smell like grapes and roses that smell like licorice. Place sweet-smelling plants where you can enjoy them throughout the season. The potency of flower scents varies greatly, so consider the strength of a fragrance when deciding where to put a plant. Subtle fragrances such as sweet peas. lemon verbenas, scented geraniums and chocolate cosmos smell wonderful right outside the back door. Add stronger scents where people naturally congregate- decks, pools and spa areas, dining alcoves, gazebos. Stargazer lilies, jasmine, lilacs, daphne, citrus and peonies will make your guests linger. Your front entry should have fragrant plants to greet you when you come home. Train a fragrant climbing rose over a pergola at the gate. Fill some of the containers in your entry with scented bedding plants like dianthus , nemesia, freesias, stock or aromatic evergreens like rosemary and lavender. 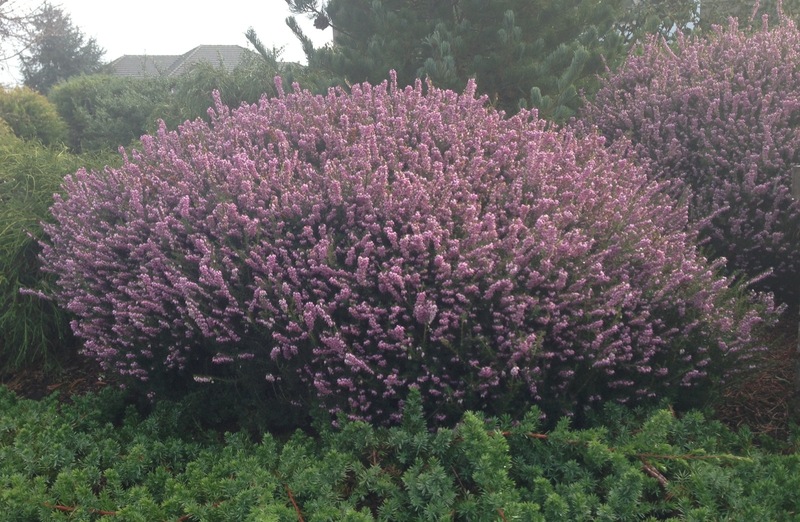 Plant sweet smelling shrubs like Mexican orange, buddleja, or philadelphus beside a path. Or plant carnations or lavender next to a garden bench or near your hammock. Be sure to include fragrant plants that release their scent in the evening, especially in the areas of the garden you most frequent after dark. Since the majority of night-scented blossoms have white flowers, these plants also light up the landscape at night. Angel trumpet or brugmansia is one such plant as is flowering tobacco and night blooming jessamine. 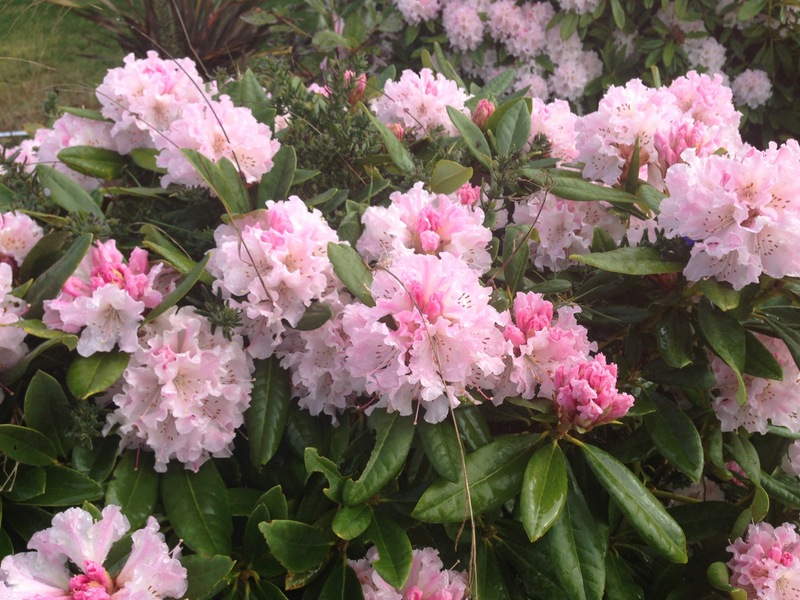 Several easy-to-grow shrubs have fragrant flowers as an added bonus. Choisya blooms smell like oranges as does pittosporum eugenoides, tenuifolium and tobira. The tiny flower cluster of Fragrant Olive or osmanthus have a delicate apricot fragrance. Other fragrant plants include California native Philadelphus lewisii. Calycanthus occidentals is native to our Central and Northern California mountains. Their fragrant burgundy flowers smell like red wine. Ribes viburnifolium, carpenteria californica and rosa californica are mildly scented, too. Ideally, when you’ve finished, your garden will smell as intriguing as an expensive perfume. The top note will be floral- jasmine, honeysuckle, rose. The middle register will be spicy, such as the vanilla of heliotrope or purple petunias or the clove of dianthus. Finally, underneath the tones that give perfumes their vigor, like artemisia, sage and santolina. Not every inch of the garden needs to be fragrant but a waft or two of fragrance from the right plants can turn a garden from ordinary to enchanting. 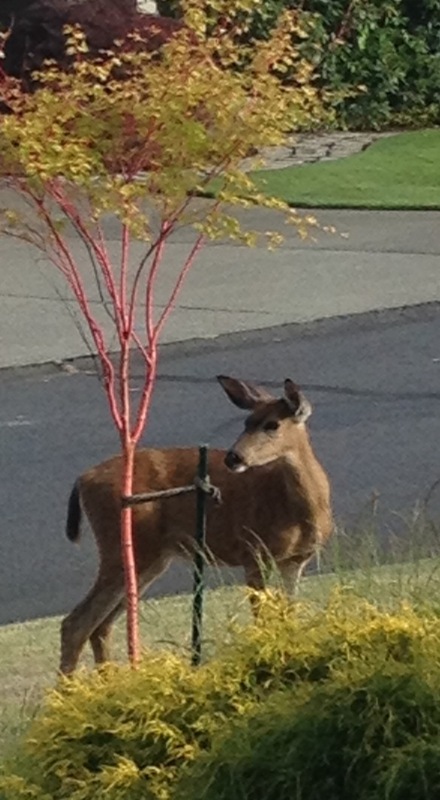 A sweet fragrance permeates the air as I step out my front door. Could it be the white flowering wild ceanothus cuneatus blooming now on the hillside and smells of plum blossoms and roses? Maybe the scent is coming from the fragrant sarcococca with those tiny white flowers you can barely see but can smell a mile away. Or could it be the sweetly scented lily-of-the-valley flowers blooming on the back patio? Make fragrance a daily delight with plants that release their perfume at different times of the day and the year. The word fragrance comes from the 17th century French word fragrantia meaning sweet smell. A garden’s fragrance can be as unforgettable as its appearance. The scent of a particular flower can make you remember past times and places. Plant them along a garden path to enjoy as you stroll, in containers to scent a deck or patio or locate them beneath a window and let their aroma drift indoors. Several easy-to-grow shrubs have fragrant flowers as an added bonus. Mexican Orange or choisya ternata blooms most of the year. 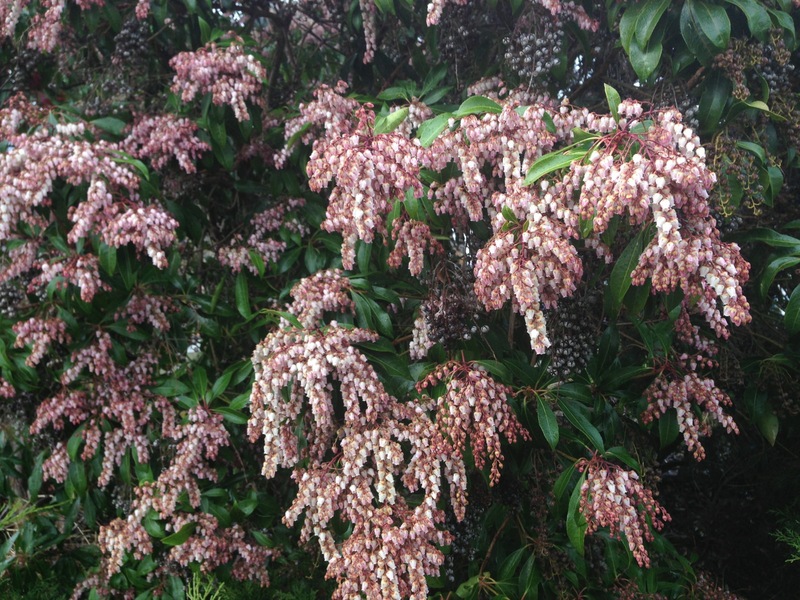 Pittosporum eugenoides, tenuifolium and tobira all have tiny blossoms that also smell like oranges. The tiny flower cluster of Fragrant Olive or osmanthus have a delicate apricot fragrance. Then there are the perennials. My garden comes on a little later than most and the buds of the fragrant variegated Zebra iris are just opening. They will smell like grape Kool-aid when the sun allows the scent to develop. Last year Chris and Rick Moran over at Brook Lomond Iris Farm gave me a couple Zebra rhizomes and they are growing quite nicely. Every year the Moran’s have a tall bearded iris show and sale over two weekends in the spring. This May 13th and 14th is the second weekend and the show takes place at their garden located at 10310 California Drive in Ben Lomond. The Iris Farm is educational, too, as the Moran’s are well-versed in organic gardening practices. Chris told me a scented flower story about an iris called Scented Nutmeg. Seems that when the long awaited flower finally opened she bent down and smelled nothing. The blue flower was pretty anyway. Later when working out in the garden she smelled cookies baking. As none of the neighbors were home at the time she was puzzled. Sitting down the smell hit her again and she realized she was right next to the Scented Nutmeg. They just needed the sun to warm up the flower to give off the scent. 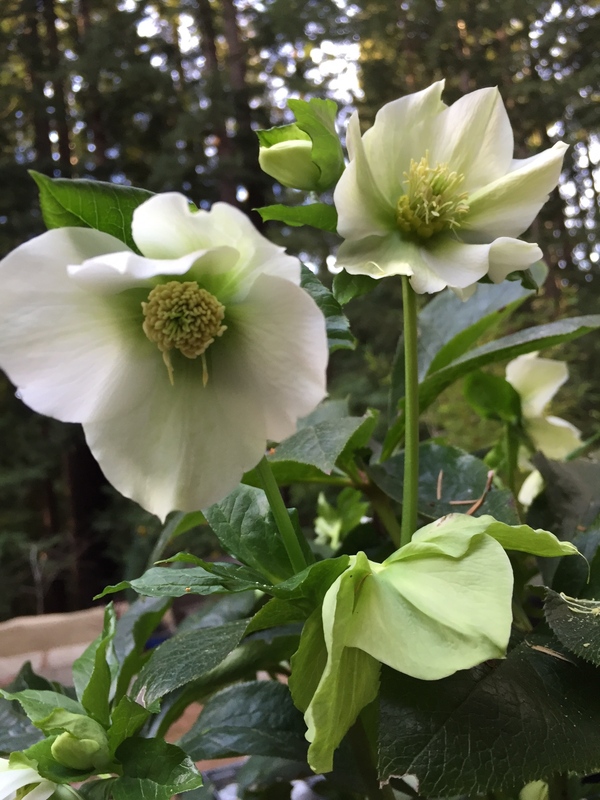 Other fragrant plants include California natives Philadelphus lewisii or Wild Mock Orange. Calycanthus occidentals or Spice Bush is native to our Central and Northern California mountains. Their fragrant burgundy flowers smell like red wine. Ribes viburnifolium, carpenteria californica and rosa californica are mildly scented, too. In spring there may be nothing quite as spectacular as a wisteria vine, loaded with fragrant purple, pink, blue or white flower clusters, covering an arbor or pergola. Pink jasmine is another vigorous vine with intensely fragrant flowers as is Evergreen Clematis. I can’t leave out the old fashion border carnation or dianthus. Their clove-scented flowers are born in profusion making them a nice addition to the mixed flower border and containers. The list goes on and includes scented plants such as nemesia, wallflower, Japanese snowbell, hosta, coneflower, daphne, vitex, viburnum, Oriental lily, gardenia, nicotiana, phlox, rose, sweet pea, hyacinth, lilac, flowering crabapple, heliotrope, lavender, sweet alyssum, peony, moon flower, southern magnolia. I remember walking with the main horticulturalist at Filoli Garden many years ago and hearing her extol the virtues of the established plantings that have survived drought and neglect with no pest problems for a very long time and are still growing beautifully in the garden. It’s not always the latest cultivars that have staying power. Some of the newer varieties are better but some are not as vigorous, some of those lovely variegated, striped or dark foliage plants revert over the years, some are prone to pests and diseases. 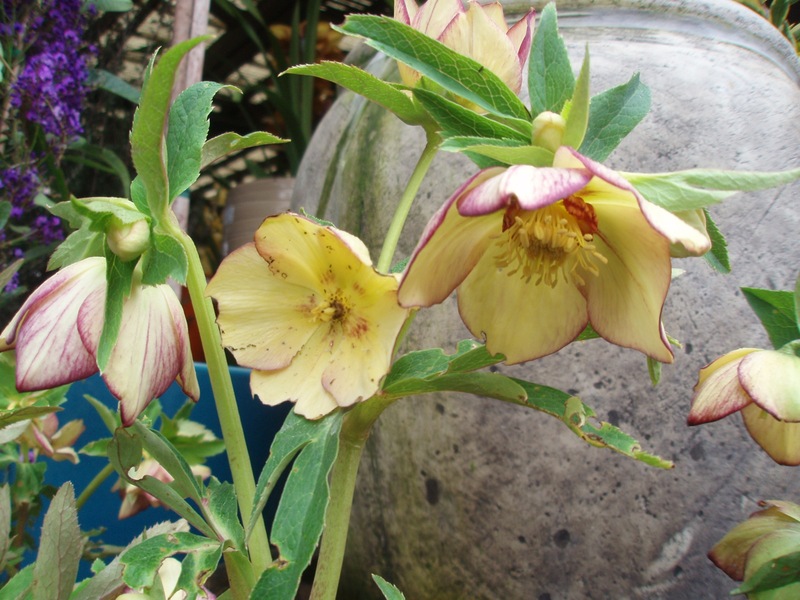 Don’t overlook using been-around-for-ages workhorse plants in your garden. Some of the survivors at Filoli Gardens over the years are California natives and others are just tough plants from other parts of the world. Take the common pittosporum you see in most every old garden. This plant makes a fine hedge, focal point or ground cover depending on the genus with a sweet fragrance in the spring while providing the bones or structure to your garden. All of the various types of pittosporum are hardy in winter, grow in sun or shade and have low water needs. Pittosporum tobira flowers are scented like orange blossoms. Pittosporum eugenoides and tenuifolium – commonly grown as a hedge or small tree – have highly fragrant blossoms as does the ground cover ‘Wheeler’s Dwarf’. On a recent trip to the Gig Harbor, Washington area, lithodora ‘Grace Ward’ caught my attention in many gardens. With those electric blue flowers covering this ground cover it’s quite the show stopper. Lithodora is used more extensively than creeping rosemary in the Pacific Northwest as it can survive temps down to 0 degree or less. 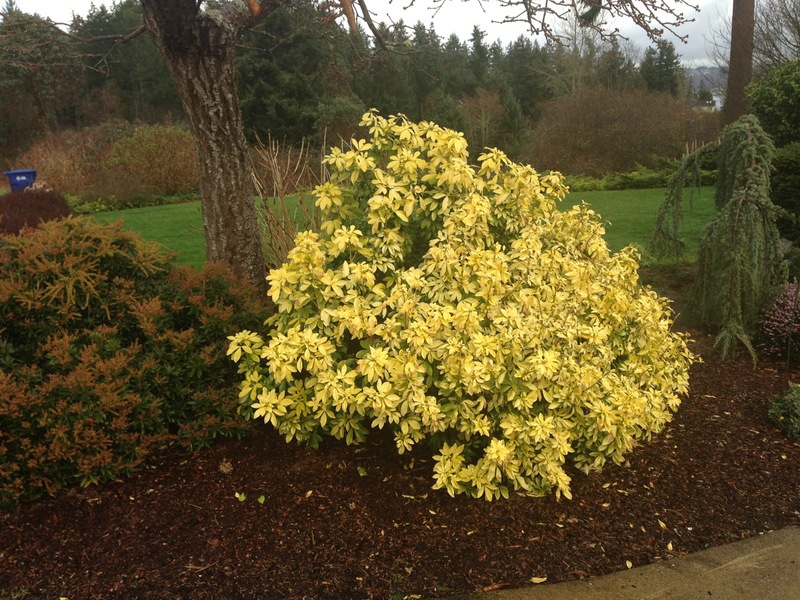 Growing with only moderate to occasional irrigation give this plant a try in your own garden. Next plant on my bring-back-the-old-favorites list is the lowly agapanthus or Lily of the Nile. Sure you see it at every fast food restaurant and hotel you pass but the reason is that it grows and blooms so reliably with little care. This is one plant where the new cultivars are proving to be just a tough as the standard agapanthus africanus. Agapanthus ‘Storm Cloud’ produces luxurious green foliage that tinges purple-red in the winter months. In summer large umbels of very deep blue flowers rise above the foliage on tall blackish stems. This variety takes a couple years to establish but blooms reliably from then on. Two smaller types of agapanthus are ‘Queen Anne’, a semi-dwarf variety and the dwarf ’Peter Pan’. Both are available with blue or white flowers. 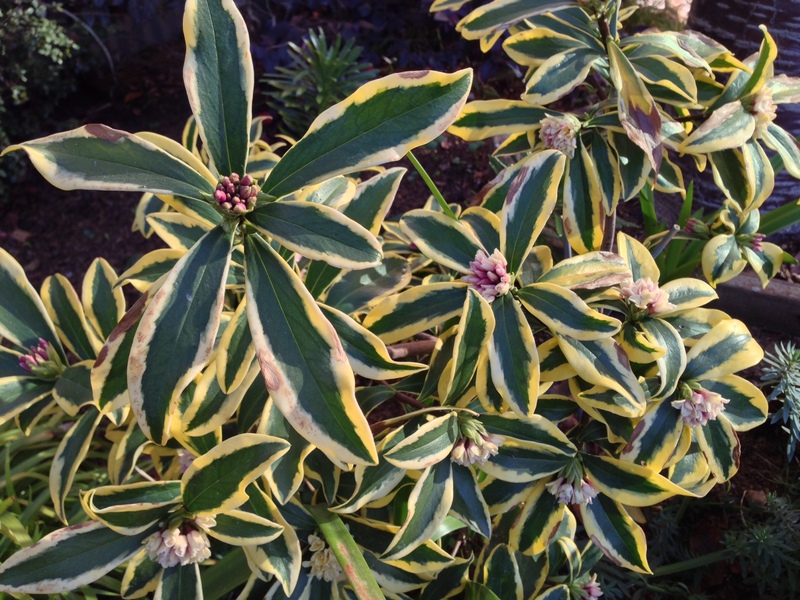 There is also a variegated dwarf called ‘Tinkerbell’ which grows well also. All agapanthus tolerate frost and neglect and require only moderate watering. So in addition to all the ceanothus- a California native- that grow so reliably don’t overlook some of these other workhorses. There’s a reason these plants have been grown successfully for such a long time. Be sure you include these old favorites in your garden along with those new cultivars that you just have to try out.